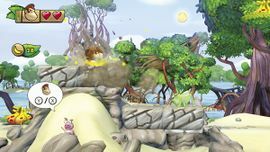 Cracked Blocks are common breakable objects found in Donkey Kong Country Returns, Donkey Kong Country Returns 3D and Donkey Kong Country: Tropical Freeze. Most Cracked Blocks contain items like bananas, and are sometimes found in stacks, especially in Tropical Freeze. The Kongs are able to jump and stay on a Cracked Block just as on any other platform. Ground pounding on it will gradually damage the block until it gets entirely destroyed, exposing the item inside it. Three ground pounds are necessary to destroy a Cracked Block, unlike crates, which only require one. Screaming Pillars turn into breakable structures when they drop on the ground. They also require three ground pounds to break. ↑ von Esmarch, Nick, and Cory van Grier. Donkey Kong Country: Tropical Freeze Prima Official Game Guide. Page 23. This page was last edited on February 20, 2019, at 22:31.